This is a surprisingly difficult scene to sketch. At first it looked like two canna lily blossoms against a green background. 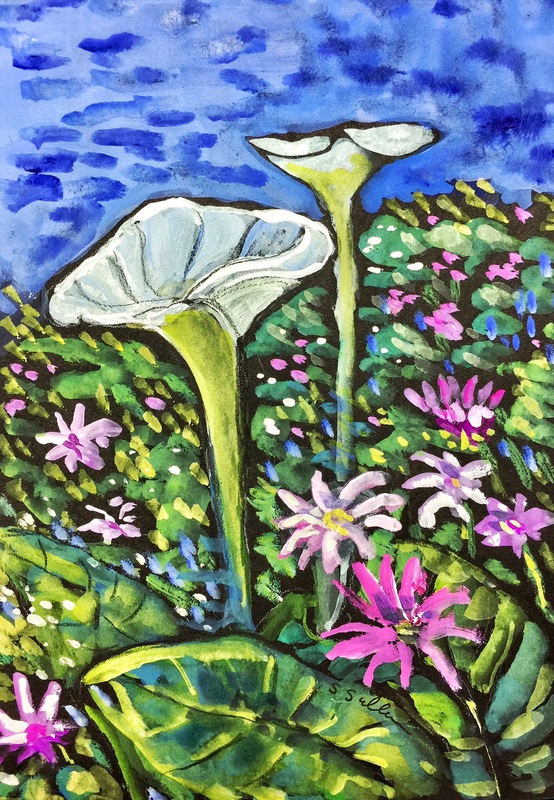 The more I sketched the more I noticed all the other flowers on the hillside and soon I had a jumble of overlapping colors with two odd lilies. I tried a second sketch with simpler shapes but returned to this one because it turns out I like the look of all the little paint strokes. I hope to do this same scene again tomorrow but perhaps without the lilies. This entry was posted in Landscape and tagged California, San Diego, Spring. Bookmark the permalink. L.O.V.E. Welcome back, you were missed!